In 1136, Earl Rognvald went to church at Pierowall in Westray at the start of his campaign to subjugate Orkney. Or at least that’s what the Orkneyinga Saga says. In the 13th Century, Lady Kirk was built and then extensively remodelled in the 17th Century. Today it lies in ruins. There are still fascinating remains of the past there. 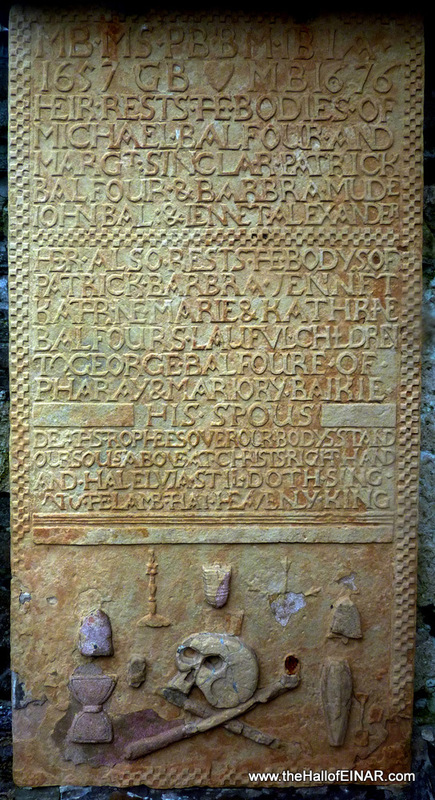 Here is a beautifully preserved gravestone from 1676, with very similar inscriptions to those found in St Magnus cathedral in Kirkwall on the mainland of Orkney. The graveyard was still used until 1879. The hand that carved the stone is so far away from me, yet so near. One Response to "Lady Kirk"